Today’s match was a bit of fun but also an experiment to see if we could catch some of the venues bigger fish by using feeder or waggler tactics. 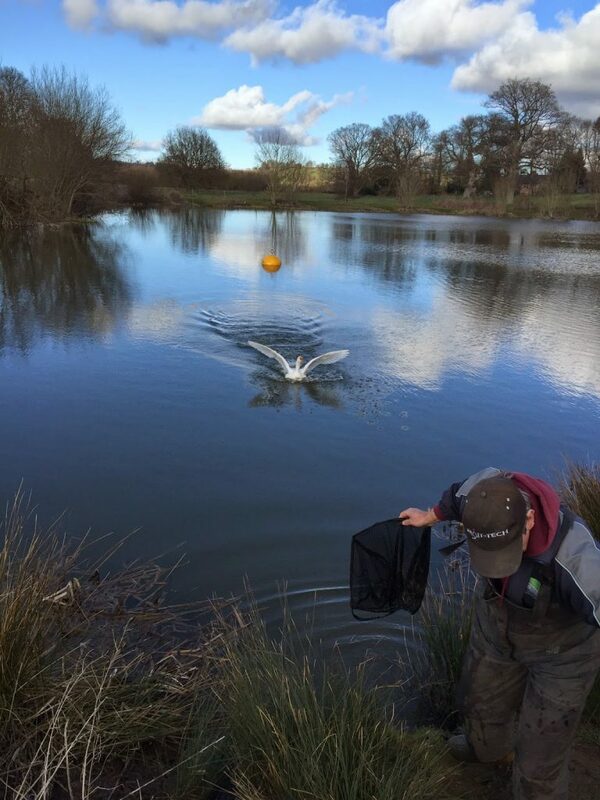 As the pond has evolved over the years, lots of different methods have come to the fore but the feeder has never really proved to be that successful, which I’m convinced is down to the depth out in the middle and I’m sure those bigger fish are swimming about up in the water. So my plan was to fish the waggler and hopefully catch some quality roach and rudd shallow on caster. I still fancied you’d need double figures to do well today and I didn’t think anybody fishing the feeder would do that as they would need at least two bream (which I’ve only ever witnessed twice in all the years I’ve fished the pond!) or half a dozen skimmers and again they don’t seem to show in those numbers. We met at the pub and there were only a few of us which was a bit of a shame and after a coffee and a bacon sarnie we headed out to the pond to do the draw so we could see which way the wind was blowing. We parked up on the road side before deciding to drive around and having a look at the other side, the wind was blowing straight into the bank which could make fishing the waggler difficult so before we headed back round the other side again we did the draw and I managed to pull out peg 21 which is the platform peg and I was happy with that. My happiness didn’t last long though as there was a very angry goose sat on the platform and he (or she) wasn’t letting me get on it! Rob said I could fish peg 22 instead so I plonked my kit down and started to set up with the goose squawking at me from next door. I can’t remember the last time I used a rod so it took me a while to work out where to put the reel and there didn’t appear to be any elastic in the top section! Joking aside, I have a lovely Preston Carbon Active Sentient float rod and Daiwa TDR 3012 reel which I don’t use nearly enough so it would be nice to give them an airing today. Float choice was a Drennan 3AAA insert peacock waggler with most of the weight around the float with just three number 8’s and a number 10 down the line to a 0.12mm hooklength with a size 18 Kamasan B611 hook. I was ready with a few minutes to go so thought it might be a good idea to try and make friends with Mr Goose, he was having none of it and charged at me which everybody else thought was highly amusing as I legged it down the bank! I eventually managed to get back on my box but that poxy bird was now sat just behind me, I tried to avoid eye contact with it but I’m sure I could see it glaring at me out the corner of my eye. We were fishing five hours today and I wasn’t looking forward to spending all match looking over my shoulder! Rob blew for the start and I cast out, sunk the line and fired some feed out, I was expecting to catch quite quickly but the float just sat there, I fed again and reeled in a few turns so my hookbait would rise and then fall through the water again, still nothing, this wasn’t going to plan. 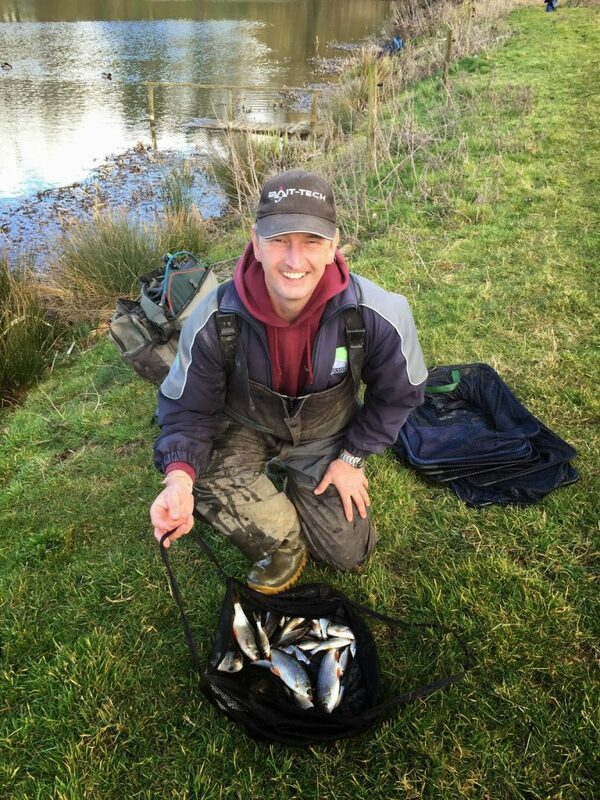 It looked like Rob in peg 20 was struggling, Hurf in peg 19 had caught a couple of decent roach and rudd and both Frank and Jake were fishing the feeder on the bottom bank but I hadn’t seen them catch yet. It took around 15 minutes before I had a bite which of course I missed! I then missed the next four or five bites as well but at least I was getting indications. I finally connected with a roach of 2oz or so and I should probably mention at this point that in a bid to stop people just catching lots of bits, Rob had said that anything under 4oz wouldn’t count, he then changed this to 2oz but as it was down to each individual to police themselves, I just couldn’t see it happening. I was missing loads of bites but did manage a 4oz rudd along with some smaller roach, I chucked back a couple of small roach but then decided to stick them all in my net and worry about what did and didn’t count after the match. Hurf’s catapult broke early on so I let him have one of my spares and he said he was getting a few fish, I was still missing loads of bites and just knew I’d be bagging up if I could have used the pole. 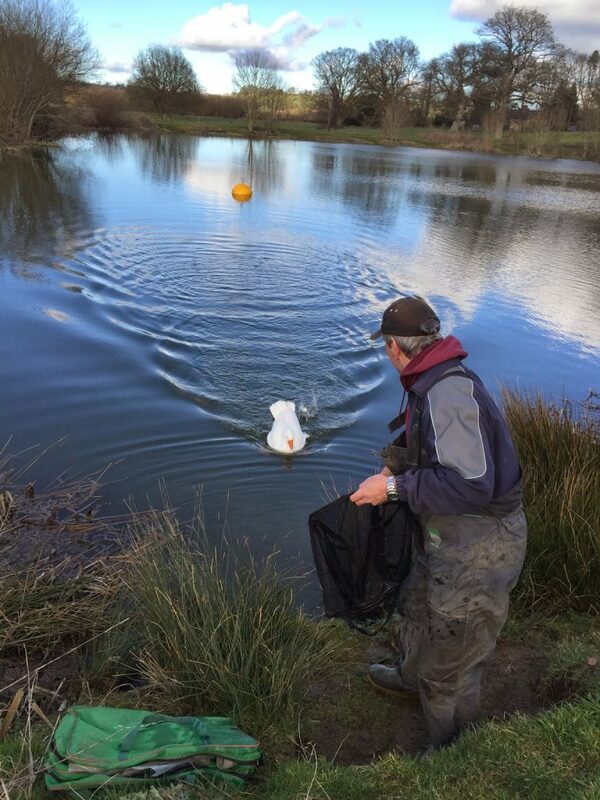 I tried double maggot and had a net roach but then went back to catching smaller samples which Rob said weren’t of a ‘countable’ size although I noticed he was putting similar sized fish in his net and it was looking like the size limits had already gone out the window. We had several visitors during the day, Bob Hammond, Steve Parker and Stu Alford all turned up for a walk round and they all asked me who I’d borrowed the rod and reel from! what were they trying to say? Mr Goose had been fairly quiet although he kept walking up the bank and eating lots of grass! (which I thought was a little odd! ), he did get a little close to my rod holdall so I thought I’d shoo him away with my landing net which was a bad idea as he grabbed it and started shaking his head like a bloody terrier (never right that animal!). More squawking followed before he got bored and wandered off to eat some more grass. I was still getting the odd net roach amongst the smaller ones but I was missing too many bites and struggling a bit if I’m honest. I did hit one bite and was met with solid resistance and head shaking, I was convinced I’d hooked a good perch but it actually turned out to be a foulhooked roach of 3oz or so! I also had another visit from the bird of Satan when for no reason and with no provocation, it attacked my carryall and pecked my reel case! 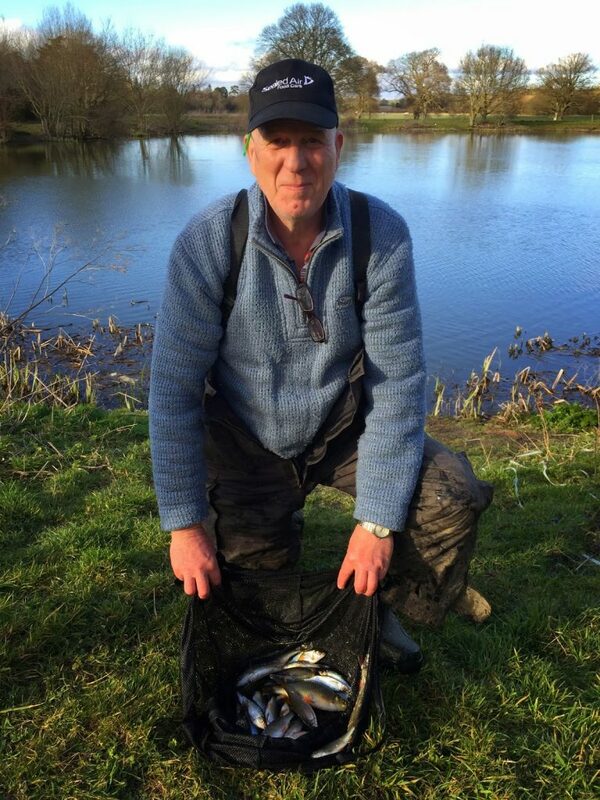 Rob called the all out and my counter read 48 fish which I thought would give me 3-4lb, I really wasn’t sure if it would be any good as I hadn’t seen anybody bag up although Rob said that Hurf had caught all day. I packed up and loaded the car before we went to weigh in the two feeder boys, Jake didn’t weigh and Frank had 1lb 11oz which confirmed my suspicions that the feeder isn’t the way to go although to be fair we might have got a better idea if everybody had fished the feeder. We then walked back to weigh me in and my fish went 4lb 13oz which was a little more than I thought, as I went to put the fish back, my feathery friend, who had been out on the lake, took off and made a beeline for me, it landed in front of me and sat there giving me the evil death stare! 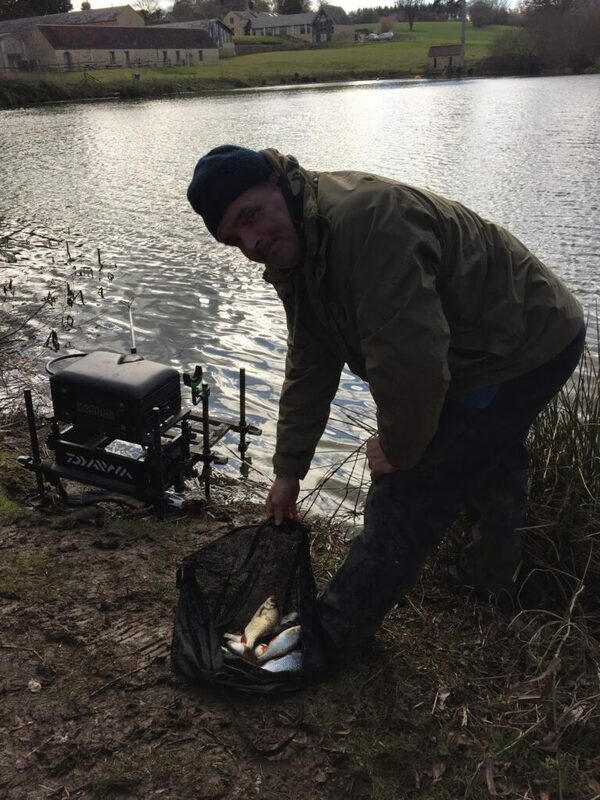 Rob then weighed 2lb 13oz before Hurf pipped me at the post with 6lb 9oz and took a quid off me as well, I had to settle for second and picked up £25. So a rather strange day with killer geese and size limits that nobody took any notice of, it was quite nice to fish the waggler for a change but at the same time it was frustrating as I knew I’d have bagged up if I could have used the pole. 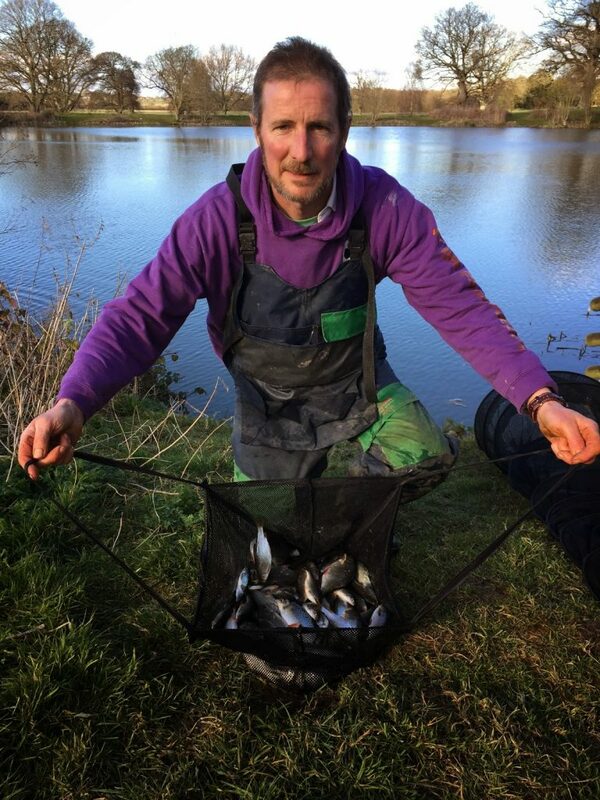 I’m not too sure what’s happening next week yet, I’ll book in for Summerhayes if there’s a match on, I would like to have a crack at those recently stocked bream in Longs but as there was a match on there today, I think it might be on Sellicks next week.